Bob Olley was the most artistic miniature sculptor during Citadel's golden age of the mid-1980's. I wouldn't say he was the best sculptor; that is a matter of taste. Nor was he the most popular (I've seen his sculptures described as "chubby" and "fungoid"). And he certainly wasn't the most prolific - he only created a handful of ranges, including Norse Dwarves, Skeletons, Space Pirates, and (my favourite) Black Orcs. So why is Olley the most artistic? Oscar Wilde said "art is the most intense mode of individualism that the world has known". If you take this as a rough definition of art, then Olley was a true artist. 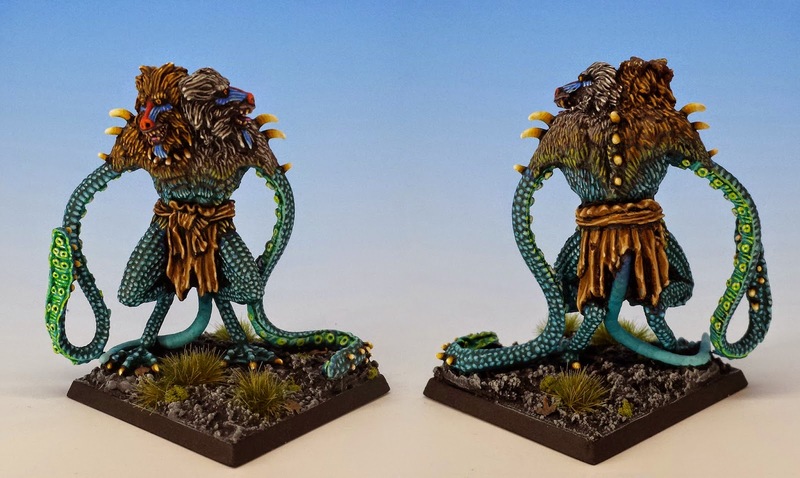 Most Citadel minis reflect the world of Warhammer. Bob Olley's miniatures reveal something about Bob Olley. Something weird. He combined an idiosyncratic sculpting style with a fevered vision of the fantastic. The resulting body of work is totally different from that of his peers.Whether you like them or not, you know a Bob Olley sculpture the moment you see it. Olley didn't work in the studio with the other Citadel sculptors, which may have insulated him from their influence. 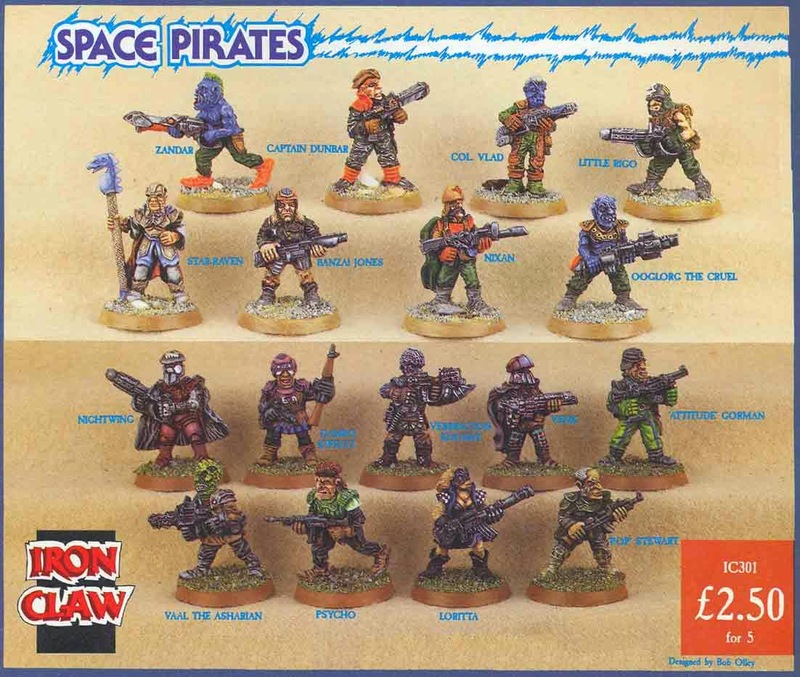 In any case, I think Olley's individual style is the reason why, starting in 1987, Olley's miniatures were produced by Citadel but released under Olley's own label, Iron Claw. His strangely proportioned and hyper-textured models didn't fit in with any other range. And indeed, I think this limited his popularity: Olley's miniatures stuck out from other Citadel miniatures like visitors from another dimension. But popularity isn't everything. What I prize in a miniature is a sense of personality, combined with true imagination. Olley has both qualities by the spoonful. Heads and hands are the most expressive element to any miniature, and one of Olley's hallmarks is over-sizing these features. His huge faces attract the viewer's eye, and give him a broad canvass to turn each miniature into a character (often, a very funny character). The other hallmark of Iron Claw miniatures is a deeply carved texture. This gives the minis a layered effect, with shaggy furs, warty skin and thick beards piled on top of each other. In this sense, Olley was a master at translating the defining artwork of John Blanche and Gary Chalk into lead. In my view, Olley's artistic flare is emphasized by the fact that he didn't actually need to sculpt that way. He's perfectly capable of making miniatures that look like everyone else's miniatures when he wants to. There are dozens examples of "normal" looking miniatures in his body of work, although I own only one of them: the Demonic Lasher from Reaper Miniatures (2003). 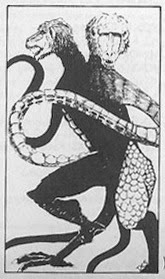 This miniature is another example of Olley capturing the essence of a great fantasy illustrator -- in this case, the sketch of the demon prince Demogorgon from first edition Advanced Dungeons and Dragons Monster Manual (1977). It's a pretty odd concept for a miniature, but Olley's sculpt is no weirder than the original picture by David Sutherland III (aka DCS). All of which is to say, I love this mini, but it doesn't have the eccentric carving style of a true Olley. 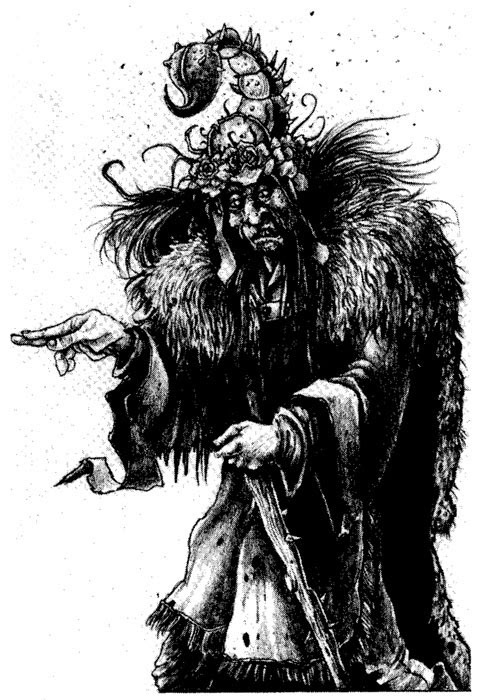 Next week, I'll feature a full set of Bob Olley's true originals: the Black Orcs he produced for Iron Claw in 1988. Great stuff, from the history lesson to the paint jobs. 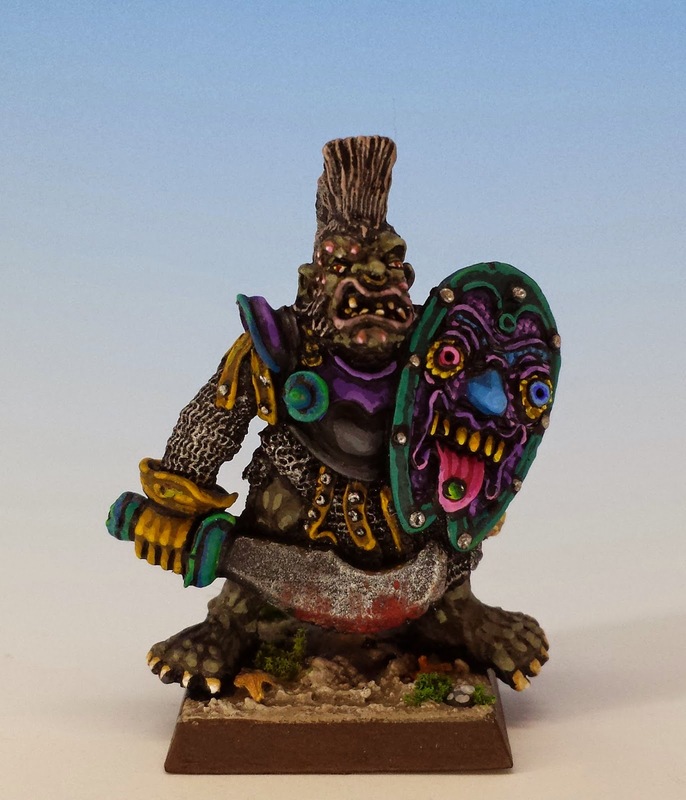 That black orc looks great as well, the shield really pops out and the base is perfect. Awesome work! You made a couple of points there that I thought hit the nail right on the head, i.e. 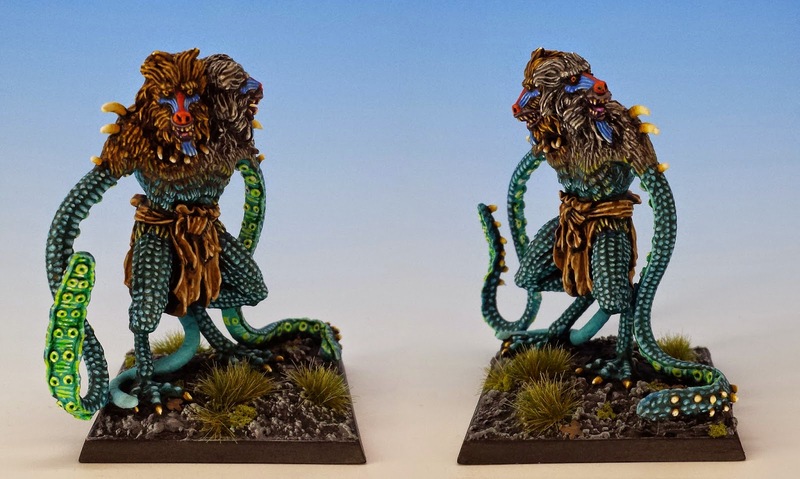 "Most Citadel minis reflect the world of Warhammer. Bob Olley's miniatures reveal something about Bob Olley." And, "Popularity isn't everything. What I prize in a miniature is a sense of personality, combined with true imagination". Exactly what I look for in a mini, couldn't care less about the popularity of a mini, just how it looks to me. Oh, and you painted up that last mini like a boss!!! Well done! Excellent synopsis on Bob Olley's! Its always nice to see Olley's work getting the attention it deserves. Youreally put words on gut feelings there. It took me a while to get to love his models but I really believe to loeve them you've got to paint them. Just take one and the minute you start applying paint on it, the "Bob Olley effect" takes place and you get why he did things the way he did. The level of detail he's putting in his models is just insane, eye lids, nose and ear details, texture everywhere and those weird almost gallic organic shapes you can either find at the end of atsropath's staff or Goblin chariot's yokes, all of these say Bob Olley. Those PSace pirates above are really wonderful sculpts and I cannot wait to get working on them. Very good post once again, a real pleasure ! Thanks for the great comments, guys! I'm glad to know that others appreciate Olley's odd but wonderful approach. I was particularly struck by Asslessman's comment about how when you paint Olley's miniatures, you get a new appreciation for them, and for his wacky detailing. Just as he wrote that comment, I was writing my next post (about the Black Orcs) and that's exactly what I was trying to say too: when you get up close to these minis, you get sucked into their world. So I think that is one of Olley's other great virtues: he made miniatures that are unusually fun to paint. I like the way you painted the Demogorgon. Excellent! Thanks Herr Z! As with all of Olley's miniatures, it was a lot of fun to paint because it was so textured and interesting. Love the way you have given credit where credit is due - Bob is a fantastic sculptor. I've been a fan for years and, with the exception of one unreleased genestealer hybrid, managed to get at least one of every one of his Citadel figures. Tony - I am so glad you stopped by and read this post! I am a big fan (and user) of your website. It's amazing, and I referred to it frequently when writing this post. Cheers!